Chronicle of the manifestation at the prison of Soto del Real (Madrid), where the comrade arrested on the 13th of April is imprisoned. 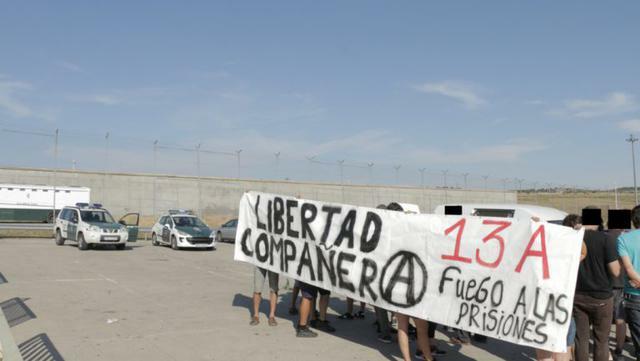 This Saturday, the 25th of June, some thirty people held a manifestation in front of the Soto del Real prison (Madrid) to show their rejection of imprisonment and of the extradition of the comrade arrested on the 13th of April, accused of the expropriation of a bank in Germany. They shouted in solidarity with the prisoners and against penitentiary centres, they read a text in solidarity with the comrade and another in which the situation of imprisoned women was explained. At the same time, they lit fireworks, necessary to transgress the walls with noise and thus breaking the imposed distance between those inside and those outside. During the manifestation some cops of the Guardia Civil appeared who asked for identification of the people present, which they refused. Despite this, the act ended with a repressive strike; the agents of authority stopped every car that headed for the exit, registering the cars and forcing identification. Let’s not forget that this Thursday 30th of June the comrade will definitely be extradited and put at the disposition of the German authorities. All this, after having received numerous abuses by the direction of the penitentiary centre of Soto del Real, such as denying her the possibility of maintaining vis-a-vis communication with her partner on the day of her wedding or the prohibition concerning telephone contact with her and another person. Let’s extend the solidary and rebellious expressions. WALLS AND GUARDS, YOU WILL NOT SILENCE OUR PASSION FOR FREEDOM!! Sinds een paar dagen is de anarchistische gevangene die vastzit in Soto del Real sinds 13 april het mikpunt van verschillende straffen door de gevangenisdirectie. Onder het mom van “veiligheidsmaatregelen” is het haar niet alleen niet toegestaan om vis-a-vis communicatie met haar partner te hebben op de dag van haar bruiloft, maar is het haar ook verboden om telefonisch contact te hebben met haar partner en eén andere persoon. Verder heeft de assistent-directeur van de gevangenis haar verscheidene soorten disciplinaire maatregelen opgelegd wegens – volgens hem – “oproepen tot muiterij” onder de andere gevangenen op de isolatie-afdeling, en nog een maatregel als straf voor het ‘s nachts praten met andere gevangenen. We begrijpen dat al deze straffen represailles zijn voor de strijdbare houding van de kameraad en haar solidariteit; ondanks de afstand en isolatie is ze vastberaden gebleven in het deelnemen aan de strijd op straat, door het sturen van een bericht waarin ze haar steun betuigt met de Banc Expropriat in Gràcia, en een brief waarin ze haar overtuigingen en politieke praktijken van strijd tegen de Staat en het kapitalistische systeem opnieuw heeft bevestigd. Vanuit het perspectief van wij die buiten zijn, kunnen al deze pogingen om haar het zwijgen op te leggen en te isoleren alleen maar beantwoord worden door middel van een vermenigvuldiging van de uitingen van solidariteit en pogingen om haar woorden, waarvoor ze haar nog meer willen straffen, wijd te verspreiden. Laten we ook niet vergeten dat de deadline van haar opsluiting in Soto del Real binnenkort zal eindigen; het wordt verwacht dat ze op 30 juni uitgeleverd zal worden aan Duitsland. Laten we niet toestaan dat ze de stem van opgesloten vechters tot zwijgen brengen! Laten we de cirkel breken waarin ze proberen onze kameraden te isoleren! Zegt het voort! Ga de straat op! Neem deel aan de call-outs! Doe iets! Since a few days, the anarchist comrade imprisoned in Soto del Real since the 13th of April has been the target of various abuses by the prison direction. Under the pretext of “security reasons” she has not only been denied the possibility of having vis-a-vis communication with her partner on the day of her wedding, but she has also been prohibited from having any telephone contact with her partner and one other person. Moreover, the assistant director of the prison has imposed on her different types of disciplinary measures for – according to him – “inciting mutiny” among the other prisoners in the isolation ward, and another measure as punishment for talking to other prisoners during the night. We understand that all these punishments are retaliations for the comrade’s combative attitude and her solidarity; despite the distance and isolation she has continued to be determined in participating in the fights on the street, sending a message of support to the Banc Expropriat in Gràcia, and a card in which she reaffirmed her convictions and political practices of struggle against the State and the capitalist system. From the point of view of us who are on the streets, all these attempts to silence and isolate her could only be thrown back through a multiplication of the manifestations of solidarity and efforts to diffuse and spread her words for which they want to punish her even more. Let’s also not forget that soon the deadline for her stay in the Soto del Real prison in Madrid will come to an end and it is expected that she will be extradited to Germany on June 30. Let’s not permit they silence the voice of imprisoned fighters! Let’s break the circle in which they try to isolate our comrades! Spread the word! Take to the streets! Participate in the call-outs! Act! LAST MINUTE: The Audiencia Nacional has ordened the extradition of the comrade arrested on the 13th of April! Call out for MANIFESTATION! The sadly famous – because reactionary –judge Ángela Murillo has ordened the extradition to Germany of the comrade imprisoned on the 13th of April, accused of having participated in the expropriation of a bank in the city of Aachen. The extradition could take place any moment within the next 10 days. As you already know, the comrade was arrested last April during a policial macro-operation in which the social centre Los Blokes Fantasma and two other houses were raided and searched, because of an international order that was sent from Germany. The prosecution office of the city of Aachen ascribes to her the material authorship of a robbery that took place two years ago, of a bank that is connected to the catholic church, where a notable sum of money was taken without causing any personal harm. The prosecution office investigated this action within a supposed series of similar expropriations that happened the year before in this city. Within this investigation an anarchist comrade from Amsterdam has also been imprisoned, who is currently outside awaiting her courtcase after having spent several months in preventive arrest. Despite having sent a call out for a manifestation on the day following the announcement of the extradition, but because of the struggle for the recuparation of the Expropriated Bank, we have decided to move the mobilisation to the coming week, next Tuesday the 1st of June, at 20h at Placa Diamant. These days of struggle, of resistance, of dignity in front of the brutality with which the police is defending the interests of the speculants, trying to abuse this space that is constructed for the neighbourhood, we feel the imprisoned comrade closer than ever. We know that she would be one more among many defending the Expropriated Bank with every means in the streets of Gracia, where she herself has lived for many years. We do not know whether the comrade is responsible for the robbery that they ascribe to her, what we do know is that expropriation in the capital of the bank, whether it is in the form of money or buildings, will always be ethically just and politically legitimate. Which is why we send from here a call out to all the fighting people in solidarity of Barcelona and everywhere, to go out into the streets on the coming Tuesday 1st of June, to show that no matter how far they take her, our comrade will never be alone. Rebellious and international solidarity with the two comrades accused of robbing banks in Germany! The struggle is the only way! Zoals vele van jullie al weten, zou de kameraad die op 13 april opgesloten werd vanwege een beschuldiging van deelname aan de onteigening van een bank in de Duitse stad Aken, in de komende dagen uitgeleverd kunnen worden. In de maand die voorbij is gegaan sinds haar opsluiting zat ze opgesloten onder isolatievoorwaarden in de Soto del Real gevangenis in Madrid, maar momenteel zijn er indicaties dat ze ieder moment aan de Duitse autoriteiten overhandigd zou kunnen worden. Haar uitlevering aan Duitsland betekent dat ze (nog verder) verwijderd wordt van haar omgeving en de mensen die haar liefhebben, evenals dat ze gedwongen opgesloten gaat worden in een gevangenissysteem dat veel gebruik maakt van isolatie, en zo de communicatie van politieke gevangenen (nog) moeilijker maakt, zowel naar buiten toe als met andere gevangenen. Daarom roepen we op tot mobilisatie en strijd, een oproep om deze samenwerkingsmanoeuvre tussen de Europese Staten tegen een strijdende kameraad niet voorbij te laten gaan zonder antwoord, die laat zien dat ze aanval tegen haar ook een aanval tegen ons allemaal is, tegen iedereen die vecht tegen het kapitalistische systeem en de ellende die ze oplegt met haar logica. Vanuit Barcelona hebben we opgeroepen tot een manifestatie op de dag na de aankondiging van haar uitlevering, en jullie zouden ons heel vrolijk maken door OP TE ROEPEN VOOR JE EIGEN MOBILISATIES EN ACTIES VAN ELKE SOORT IN JULLIE EIGEN DORPEN EN STEDEN, op dezelfde dag als de manifestatie in Barcelona. We willen haar in vrijheid, we willen haar dichtbij! Vrijheid voor vechtende en vervolgde gevangenen! Niet eén kameraad alleen in de handen van de Staten! As many of you already know, the comrade who was imprisoned on the 13th of April, accused of having participated in the expropriation of a bank in the German city of Aachen could be extradited in the coming days. In the month that has passed since her imprisonment she has been locked up under isolation conditions in the Soto del Real prison in Madrid, but right now there are indications she could be handed over to the German authorities any moment. Her extradition to Germany will imply creating a (even greater) distance between her and her loved ones, as well as forcing her into a penitentiary system that uses isolation extensively, making the communication of political prisoners (even more) difficult, toward the outside as well as with other prisoners. Because of this we call out for mobilisation and struggle, a call out to not let this manoeuvre of collaboration between the European States against a fighting comrade happen without a response, showing that the attacks against her are also attacks against all of us that fight against the capitalist system and the misery it imposes with its logic. From Barcelona we have called out for a manifestation on the day following the announcement of her extradition, and you would make us very happy by CALLING OUT FOR YOUR OWN MOBILISATIONS AND ACTIONS OF EVERY KIND IN YOUR VILLAGES AND CITIES, on the same day of the manifestation in Barcelona. We want her free, we want her close! Freedom for fighting and persecuted prisoners! Not one comrade alone in the hands of the States! Een paar dagen geleden, toen we al uitgingen van de deportatie van de kameraad die op 13 april gearresteerd werd, kregen we te horen dat de Spaanse Audiencia Nacional besloten had de uitlevering aan de Duitse Staat met een maand te verlengen. Dit was een reactie op een eis gesteld door onze verdediging, gebaseerd op het trouwproces dat gaande was voordat de kameraad werd opgepakt. Precies op het moment dat we het juridische besluit te horen kregen, was de kameraad overgeplaatst naar de vrouwengevangenis in Brieva (Ávila), waarvandaan we dachten dat ze voorbereid zou worden op haar vlucht naar Duitsland. Terwijl ze daar was lukte het haar onderstaande brief ons te laten bereiken, geaddresseerd aan de buitenwereld. Op het moment van schrijven zit de kameraad wederom in de Soto del Real gevangenis in Madrid, in isolatie en met gedeelde luchtplaats. Ze zal hier tot tenminste 30 juni blijven, the dag waarop de verlengde periode, toegezegd om haar huwelijk te kunnen realiseren, zal aflopen. Ondertussen roepen wij op onze solidariteit met haar op straat te blijven tonen, onze steun voor alle gevangen vechters te laten zien, en onze meest diepe minachting voor het systeem dat hen gegijzeld houdt om haar ellendige orde te beschermen. Kameraden, ik schrijf vanuit de Brieva gevangenis in Ávila, waar ze me net naartoe hebben gebracht na anderhalve maand in de Soto del Real gevangenis in Madrid, altijd in FIES en in het isolatie regime. Ik wilde dagen geleden al geschreven hebben, maar alle communicatie en informatie is bijzonder traag and beperkt, daarom heb ik het tot nu toe niet gedaan. Ik waardeer alle uitingen en signalen van solidariteit en steun ontzettend. Ik heb ze zo sterk gevoeld dat ze dwars door de muren, de tralies en het hele systeem van controle en toezicht heen gingen. Hoe hard ze het ook proberen, ze zullen nooit in staat zijn onze wilskracht en onze keuze in opstand te komen, tegen deze wereld van complete miserie waarin ze ons dwingen te leven, tegen te houden of af te remmen. Het zijn bij uitstek de moeilijkere omstandigheden die ons meer kracht en vastberadenheid geven om door te gaan met het slijpen van de vele fronten van strijd die we hebben, hier binnen net zoals daar buiten. De strijden voor de bevrijding van iedere vorm van onderdrukking and autoriteit zijn veelvoudig, net zoals de rechtvaardige en legitieme methodes en praktijken. Van de simpele weigering van autoriteit tot de aanval of de onteigening van een bank, om maar een paar voorbeelden te noemen… Wat altijd het belangrijkste is aan de acties is dat ze zichzelf kunnen verklaren en in zichzelf begrepen kunnen worden; door hun doelen, hun beslistheid en hun waarde. Wanneer de verschillende strijden zich verbinden in een bredere context, vullen ze elkaar aan en maken ze elkaar sterker, en bovenal breken ze de scheiding tussen het dagelijkse en persoonlijke met het politieke, omdat alle beslissingen die we in onze persoonlijke levens maken uiteindelijk politiek worden, net zoals alle politieke besluiten die we nemen op een directe manier onze persoonlijke levens beïnvloeden. Alhoewel het duidelijk is dat we voorzichtig moeten zijn met iedere stap die we zetten om niet in de klauwen van de Staat en haar onderdanen te vallen, weten we dat strijd een prijs heeft, omdat de Staat en de media iedere keer antwoorden met meer repressie en een mediatieke jacht op iedereen die haar het hoofd biedt. Kracht en solidariteit voor iedereen en alle vechters, vervolgd en opgesloten! De strijd gaat door, ze zullen ons nooit kunnen tegenhouden! Extradition to Germany postponed and letter from the comrade currently imprisoned in the Soto del Real Prison in Madrid, Spain on suspicion of a bank robbery in Aachen. A few days ago, when we already took for granted the extradition of the comrade arrested on the 13th of April, we heard of the decision of the Spanish Audiencia Nacional to postpone by one month the handing over of her to the German State. This was a response to a demand made by our defence based on the process of marriage that the comrade was realising before she was arrested. Precisely in the moment of hearing of the judicial decision, the comrade had been transferred to the women’s prison of Brieva (Ávila), from where we believed she would be prepared for her flight to Germany. Being there she managed to get this card to us, addressed to the outside, which we reproduce below. At the moment of writing the comrade is once again in the Soto del Real prison in Madrid, in isolation and sharing the yard with other prisoners, until at least the 30th of June, the date on which the extended period granted to enable the celebration of her wedding will end. Meanwhile, we call out to continue showing our solidarity with her in the streets, to show our support of all the imprisoned fighters, and our most profound contempt of the system that keeps them hostage to defend its miserable order. Comrades, I write from the Brieva prison in Ávila, where they have just transferred me to after a month and a half in the Soto del Real prison in Madrid, always in FIES and isolation regime. I wanted to have written days ago, but all the communication and information is very slow and limited, and therefore I have not done it until now. I deeply appreciate all the expressions and signs of solidarity and support. I have felt them so strong they transgressed the walls, the bars and the entire system of control and security. No matter how hard they try, they will never be able to break or brake our willpower and our decision to rebel against this world of complete misery in which they oblige us to live. It is especially the more difficult conditions that give us more strength and determination to continue and sharpen the many fronts of combat we have, here inside as much as outside. The struggles for the liberation from every kind of oppression and authority are manifold, just like the just and legitimate methods and practices. From the simple negation of authority to the attack or the expropriation of a bank, there are many examples… The forever most important thing of the actions is that they can explain themselves and be understood for what they are; for their goals, finality and their value. When the different struggles connect themselves in a wider context, they compliment and reinforce each other, and above everything break the division between the daily and personal with the political, since all the decisions we make in our personal lives end up being political, like the political decisions we take directly affect our personal lives. Although it is obvious we have to be careful with every step we take so as not to fall into the claws of the State and its servants, we know that struggling does not come for free, since the State and the media every time respond with more repression and a mediatic hunt toward all of us that face them. Strength and solidarity to everyone and to all the fighters, persecuted and imprisoned! The struggle continues, they will never be able to stop us!